Not suitable for milk and fruit juice containing pulp. 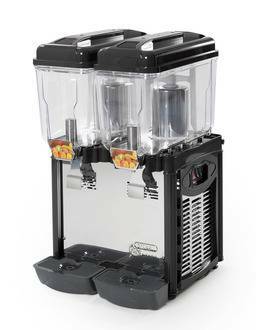 Serve your tasty, chilled beverages in this refrigerated juice dispenser. Using a stainless steel base and evaporator, this sleek, attractive dispenser is the most durable choice for a commercial, self-serve setting. It’s built to last through day-to-day use; you no longer have to worry about getting a new unit every few months. Your customers will find ease when serving themselves, by simply pressing their cup to dispense the drink of their choosing. The polycarbonate bowls are easily removable to facilitate cleaning to the utmost. They are also very easy to clean and hold a remarkable 12 liters each; allowing you more time to tend to your business before refilling. It features a high chilling capacity for quick and efficient production even in the hottest weather. Fill up on everyone’s favorites; lemonade, fruit punch, iced tea and more! Your customers will be refreshed while your impulse sales skyrocket!